Children who are encouraged to draw and scribble stories at an early age will learn to compose more easily, effectively and with greater confidence than children who do not have encouragement, according to the finding of US Department of Education. So if you would like your children to learn to write start and develop their interest at an early age by encouraging their love of creativity and help them learn new words. 1. It is a good practice for parents to start reading to your children when they are still babies. You can use board books, coloring books and short story magazine. This will help your child to recognize words at an early stage. 2. Encourage your child to write and hold a crayon or pencil during their play time. It can help their interest to start writing and reading. 3. Be a model to your child. If your child watches you writing then they will be interested also in learning to write themselves. 4. Give your child the freedom to write what they like. Accept your child’s writing mistakes. 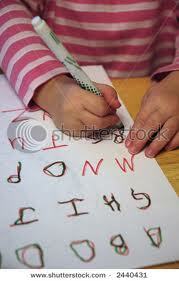 It is normal that children tend to invent their own words and spelling and even how the letters are written. The important thing for parents to do is to focus on the content more, than on the form or the way it is written. Let them exercise their own creativity.